Wix is a popular free website hosting platform, that has 73 million users across 180 countries (stats from Wix themselves). Recently while working on an investigation, I was spending time hunting around a website that is hosted on Wix and I discovered an interesting anomaly. 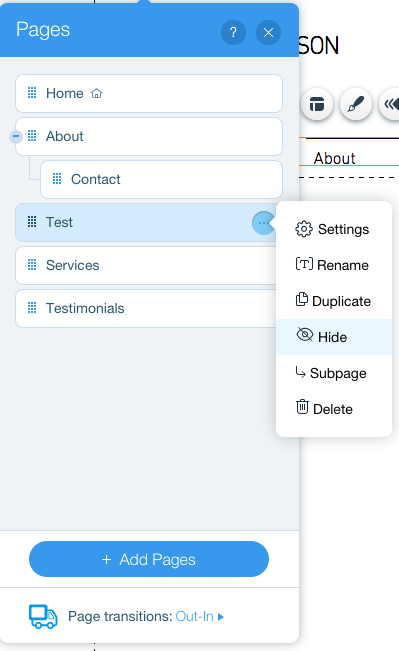 Wix has a WYSIWYG editor that allows you to build your entire site, and through that editor you are able to create new pages, hide these pages or delete them. What I discovered is that although you can hide content from a passing user, the content is still accessible to the general public by analyzing the underlying code on the hosted web page. This post will walk you through how I discovered this, and how we can write code to automatically extract the data that is hidden from view. Do note that this isn’t really a vulnerability per se, but is an implementation flaw in how Wix renders pages in the browser. To test out my theory, I simply created a new Wix account and used a default template. If you click on the navigation bar of the site, you’ll get a little menu. Here you can click the Navigate button that will open a sub dialog where you can add a new page. Let’s do that, and set the page to hidden. Now if you click the Publish button on the top right of the site, your page should be live and you can go and view it. You will notice that your test page that you added and then hid, is not viewable on the site. The interesting thing is that depending on your target site, Google might have had the opportunity to index these pages before they were hidden, and sometimes it won’t. Let’s see how we can extract the hidden page. Now that we can do this, let’s create a script that will mine all pages from a Wix site automatically for us including hidden content. While reviewing all of this code, I also discovered a key called timeSincePublish which is a timestamp value of when the owner of the site last clicked the Publish button. This is NOT the original publish date of the site itself however. This timestamp can be useful from an investigation perspective if you are building a timeline of events on a target or if you are looking for a date correlation to other events. Now we have retrieved the main page JSON we can iterate over the information and begin retrieving all of the published pages for this Wix site. Let’s implement the code to do that. Lines 38-40: we grab the first JSON URL from the page list (38) and retrieve it (40). Line 45: here we are building the search engine friendly version of the page so that we can store it as plain HTML. We are using the pageUriSEO key as well as the pageId to build this URL. Lines 47-55: we retrieve the HTML (47) and then store the page (50) and store the raw JSON as well (54) for the page. That is it! 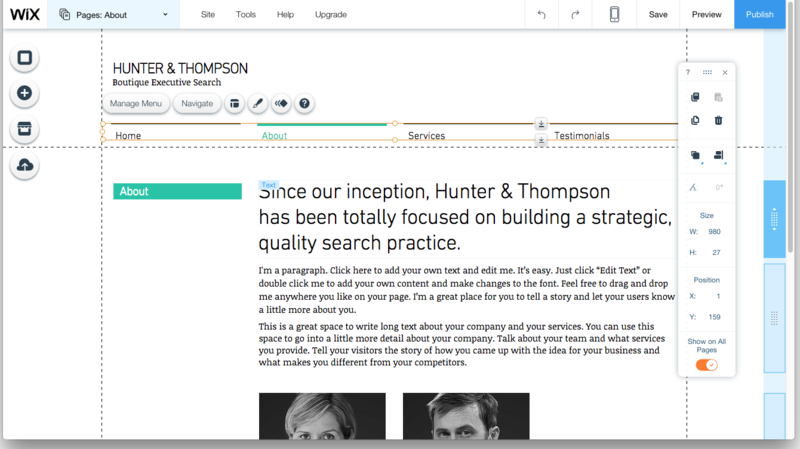 Find yourself a Wix site to target, and give it a run. I also encourage you to test out hiding content on your own test site and see how it works. Remember my post that dealt with mining Google Analytics codes? If you are looking to find Wix pages to test, just spin up a test Wix account, and point the Google Analytics mining script at your test page. All Wix sites appear to share a common Google Analytics tracking code so you’ll have no shortage of sites to look at when it returns its results. Be patient, there are a pile of results! Hiding a page just means hiding it from the menu and you finding it. Big deal. Hiding pages is a design decision not a security decision. Break into a page that’s protected for members only/PW protected, I think you’ll have a much tougher time. it’s pretty obvious that hidden pages are not protected from access trough direct link once a search engine crawled: same happens even if you use joomla! and you hide items. It’s fault of the web designer that probably has not much experience and can endanger other users. Justin, why not post your code in text form 🙂 As for above comments, they obviously overlooked Justin’s introduction (“not a vulnerability per se”). WordPress is in that respect also troublesome. You can examine most content on a WordPress site, even if not linked to a menu or another post by using the “search” function” without entering anything. There is no real way to limit the search function, and even removal may not always work as most themes put a link to the search function in the 404 page – you actively have to remove the functionality if you want to control who can look at what. I can often see attempts to probe for intelligence by people iterating through author IDs – as I disabled that, it shows up in my 404 logs too (as do attempts to reach the admin interface which no longer lives at that URL 🙂 ). It’s an interesting find but as others mentioned the hide button is simply a way to hide the page from the menu not to keep it hidden from viewing. Regarding google indexing the page, you can select “hide this page from search results” to presumably prevent google from indexing the page. You can also mark the page password protected or member’s only as well.